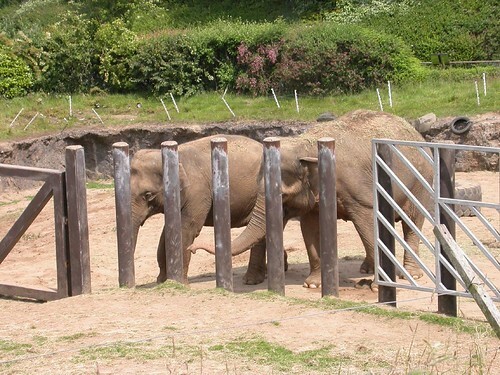 Melancholy Elephants and Copyright | Marie Loughin's "I WANNA BE . . ."
← Ray Bradbury — How do I begin? 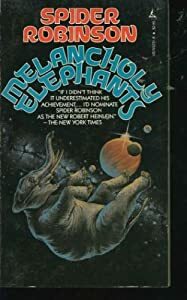 Twenty-five years ago, I read a science fiction short story called Melancholy Elephants by Spider Robinson. And for twenty-five years, this story has popped into my head whenever I hear news of lawsuits for copyright infringement. Melancholy Elephants is a good story. It won the Hugo in 1983. But more than that, it is an eloquent argument that copyright duration should be limited, not for the benefit of those who wish to exploit the work of others, but for the long-term good of the artistic community. Don’t you see what perpetual copyright implies? It is perpetual racial memory! That bill will give the human race an elephant’s memory. Have you ever seen a cheerful elephant? Melancholy Elephantsis set in a future where humankind has spilled out of the planet and spread through the solar system. With so many people, enough music is being written that composers struggle to write pieces that can be considered original. The protagonist argues that perpetual copyright would amount to cultural suicide. This all sounds farfetched, I know. And besides, the crisis (if there is one) will peak in the future. It probably won’t affect us personally. Or will it? There’s another side to the copyright issue. I wanted to infuse my novel with a sense of traditional hobo culture. Since Woody Guthrie is the quintessential hobo poet, it seemed natural to include snippets of his lyrics in appropriate places (with attribution, of course). I didn’t worry about copyright. My publisher would take care of that for me. Then I decided to go indie, and I became the publisher. 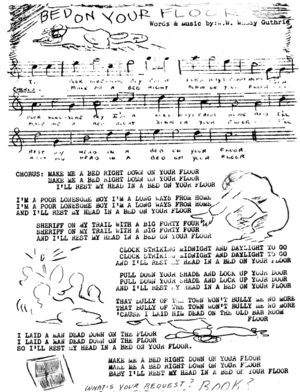 I looked up the copyright status of Guthrie’s lyrics and found a form for licensing lyrics. I’m not a copyright expert and didn’t want to pay to hire one. The way I saw it, I could (1) file a request to license the lyrics, risking a long wait for an answer that might include a request for payment for their use, (2) use the lyrics without licensing and risk a lawsuit, or (3) drop the lyrics altogether. The safest route was to drop the lyrics and that is what I did. It didn’t really hurt my novel. But it might have hurt Woody Guthrie. Suppose I included the lyrics and my book went viral. Thousands of people would be exposed to samples of Woody Guthrie’s work. Folks who’d never heard of him might be intrigued and look him up. They might buy his recordings and sheet music, maybe even perform his music for others. He might become known to a new generation of fans—without costing Woody Guthrie Publications (Woody’s been dead 45 years) a penny. Instead, my readers will see only his name in a blink line. My daughter is a singer. So far, she performs the work of others, but she cannot record their music for sale unless she pays for licensing. In Canada, laws are being made that will prevent her from performing copyrighted music in any public setting unless she pays a fee. She’s fourteen. If she had a real gig, she might get $50. Guess what—she’s now learning to write her own music instead of perpetuating the work of people like Jewel, U2, and Florence and the Machine. This doesn’t really hurt my daughter. But I would argue that it hurts the others—if only a tiny bit. The older and more obscure the copyrighted music the more it hurts the original composition to not be performed. As much as the idea of Pride and Prejudice and Zombies makes me cringe, might this book inspire people to read Jane Austen’s original book? Might Peter and the Starcatchers inspire kids to read the original Peter Pan? “Spread as wide as possible,” she said in a tone that called me an idiot for asking. No artist wants to be forgotten. This entry was posted in Writing and tagged copyright, fiction, publishing, Spider Robinson, Woody Guthrie. Bookmark the permalink. Very thoughtful, Marie! I’d also rather have my work out there instead of the 25 cents a starving artist might send me! Thank you. Great entry. I’ve railed about the copyright situation a few times, and this is another consequence that gets overlooked. I’m going to have to look into that book. Melancholy Elephants is, appropriately enough, available to read free online. Just click on the link in the post. The collection seems to be out of print, sadly. I suspect the way copyright is set up right now is the result of a compromise that nobody liked, but it was the best they could come up with. It’s such a tricky subject and people make it overly complicated. Ideally, to me, would be let the owner select the length of copyright. They get an option of, say, 5 years, 10 years, 15 years, with one chance to renew if they wish. But that could lead to a lot of “special” exemptions and then it would get complicated and expensive and screwy again. It’s a subject well worth exploring. Who knows? Maybe it will result in a compromise that’s better than the last one. In the pharmaceutical industry, a company that develops a new drug gets sole ownership for a period of time (5 years?) during which they will have no competition and can make back their initial investment. Hopefully they’ll profit, too, because that’s what motivates to continue working on products, which are sometimes badly needed. After that period, other companies are free to produce generics, but the original company has that still has that name brand benefit. Seems reasonable to me. Complicated issue. I tend to agree with Jaye – with a clause to renew. Love your daughter’s response. My son shares his music on soundcloud.com and you know I dealt with the same issues when I wanted to include a line or two from numerous songs in my novel to give the reader a sense of the passage of time. It seems ridiculous that we could get sued quoting a couple of lines from a song, or run into trademark issues if we mention a character from a movie. Franchises like Star Trek & Star Wars should be thanking fanfic authors who kept those fandoms alive (and infringed copyright)! Yeah, I don’t understand why they wouldn’t want the free advertising. I suppose they are trying to keep blatant exploitation at bay and end up squeezing out the good with the bad. Part of what makes literature wonderful is the conversations books can have with one another. When themes or symbols are picked up and rewoven into disparate works, they are given greater resonance by their very repetition. There is the thrill of recognition, of linking ideas and moods without regard to temporal distance. I would love it if someone thought enough of my writing to include phrases from my book in theirs. No one should take credit for those words, they should be attributed to me – but once published, the words are no longer strictly mine in any sense except legal. Published works are part of the collective consciousness. They are meant to be shared. That said, I’ve seen people get very upset at someone else just saying that their book was like hers, basically that readers who like Author X will enjoy books by Author Z. Copyright is there to give the creators the option to decide how freely their work can be assimilated into the general culture. I think that there should be some amount of time where a creator does have full say, mostly because without that guarantee, some great things might not make it to the public. I have my works copyrighted, but would not want them to stay that way in perpetuity, and certainly not to exceed my lifespan. Marie, I really like this post. You brought up sides to the issue I would’ve never thought of that addressed both sides. On one hand, I know I’m pretty protective of my work, but not in the sense that I don’t want anyone to quote me or reference my work. More that I don’t want someone to take my story idea and claim it as their own. Of course, I don’t know the actual numbers (if there is any legitimate way to count them anyway) but I’ve heard somewhere that when you get a “new idea,” hundreds of other people will get the same idea. But I would’ve never thought about the fact that more people might listen to Woody Guthrie as a result of you using his lyrics (unfortunately for him, though, you made the right decision. Copyright infringement is huge. You don’t want to mess with that one). It’s a great argument. And I really like the point you make on the other side with your daughter. She is learning to do her own thing. Will it still be influenced by those artists? Most certainly, but her work will be her own. Thanks, Paul. That’s the reason for this post–to get people to think about more sides to the copyright issues before they start changing things. Perpetual copyright may seem like a good thing, but I don’t think it is. As for ideas, well, it’s hard to prove plagiarization of ideas in fiction. Writers have a tendency to make ideas their own. The good ones, anyway. This was a great post, Marie. It’s a perspective I never really considered. Guess I’ll have to watch my step. I think the happy horror writer’s reply was very eloquent, and regarding what Paul said about hundreds of people getting an idea at the same time, I definitely remember reading an article on memes that said pretty much the same thing. Thanks for this! I’ve been scooped before by others getting the same idea and writing faster than I do. That’s part of the game, I guess. Thanks for stopping by!